Love is in the air as Valentine’s Day is approaching and it’s another year that I am without a boo. I have been in a relationship a few times around Valentine’s but one was long distance and the other was high school and my boyfriend at time had no job. With that being said I have never really celebrated the holiday unless it was with friends or family. Some of my best memories have been on Valentine’s though. There was this one particular Valentine’s I was anti-love to the fullest. It was my sophomore year of high school, I didn't have a boyfriend well most of my friend did. I wore all black; I didn't want any candy, flowers, or cards. During high school an organization on campus sold candy hearts three weeks before Valentine’s. You could buy a heart for somebody and it would be delivered to them on Valentine’s. Well to my surprise I show up to homeroom and the girl walks in passing out hearts…I’m expecting nothing and she walks up to my desk and hands me like 8 hearts. I was in shock but it changed my mood so quickly. I learned a very valuable lesson that year which was just because you aren't in a relationship it doesn't mean somebody isn't thinking about you. I also learned that Valentine’s Day is not the only day to show somebody that you care; there is 365 days in a year to do that. I had 8 people who had taken time to show me love and make me feel good. 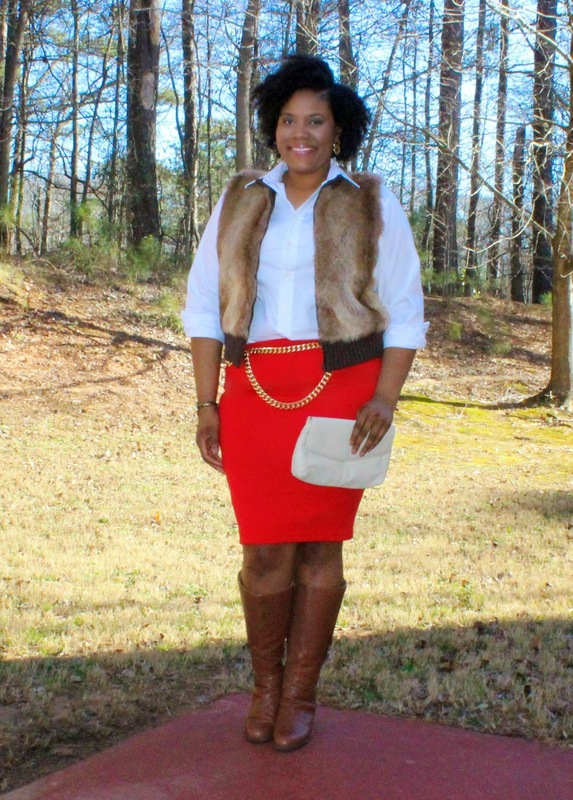 My day time outfit is perfect for a movie date, a lunch date or an outing with friends. I wanted this outfit to be comfortable and classic my two favorite things. 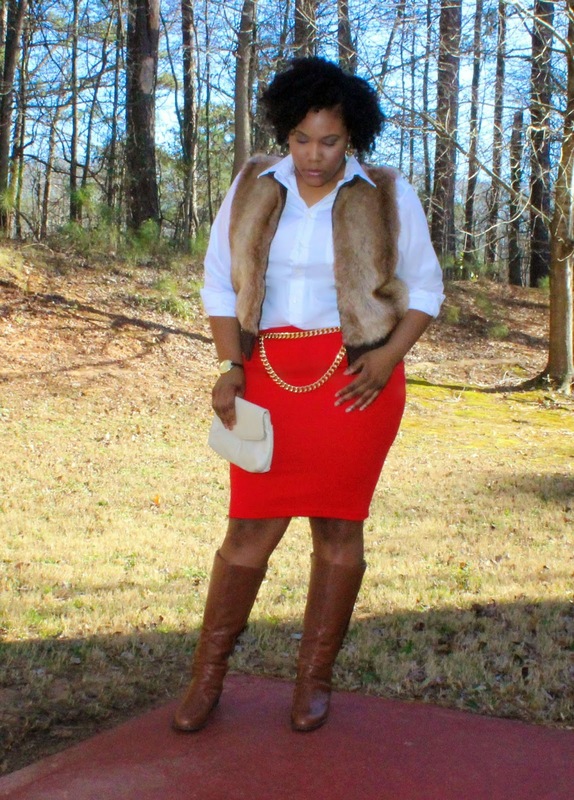 I paired a red bodycon skirt with a simple white button up the ultimate classic piece. I then decided to be daring and tuck in the shirt in and accessorize with my double chain belt. For jewelry I stayed simple with cold earrings and my gold faced watch. 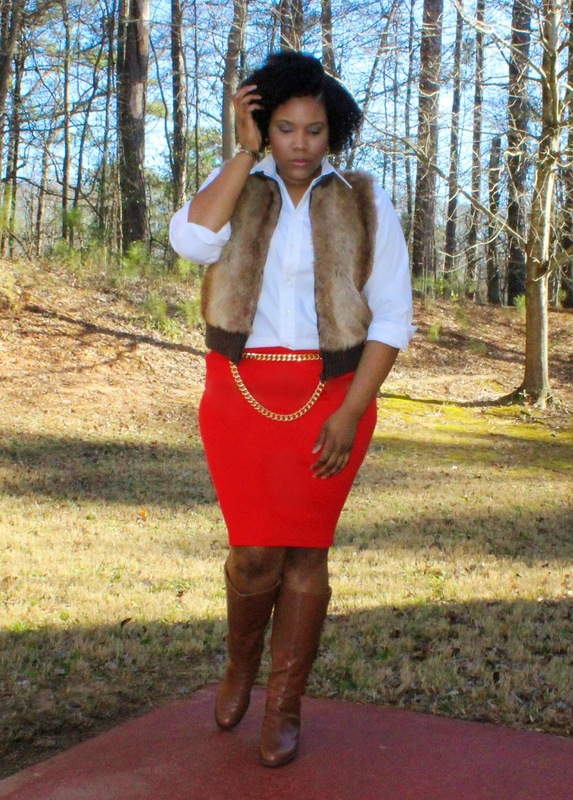 To complete the look I layered my faux fur vest and threw on my cognac colored boots to keep the comfortable level at a 10. Do you love all year long? 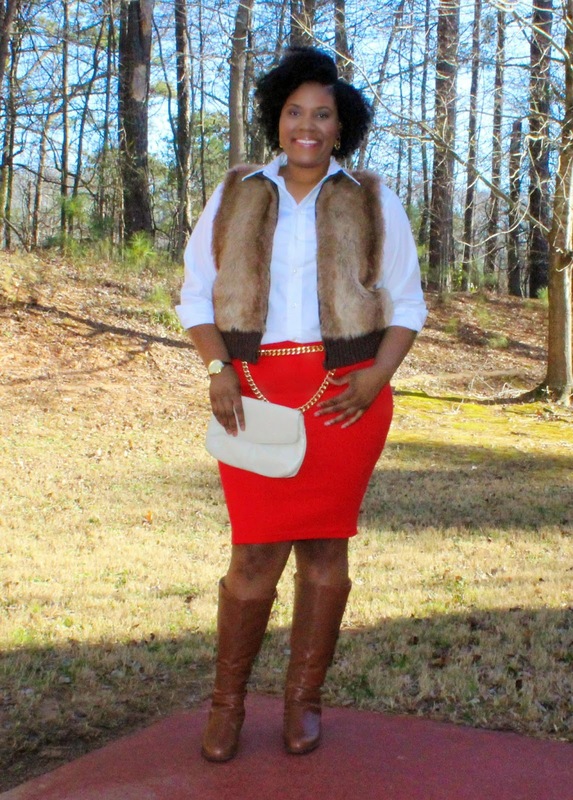 Red, White, and Fur, great combo! 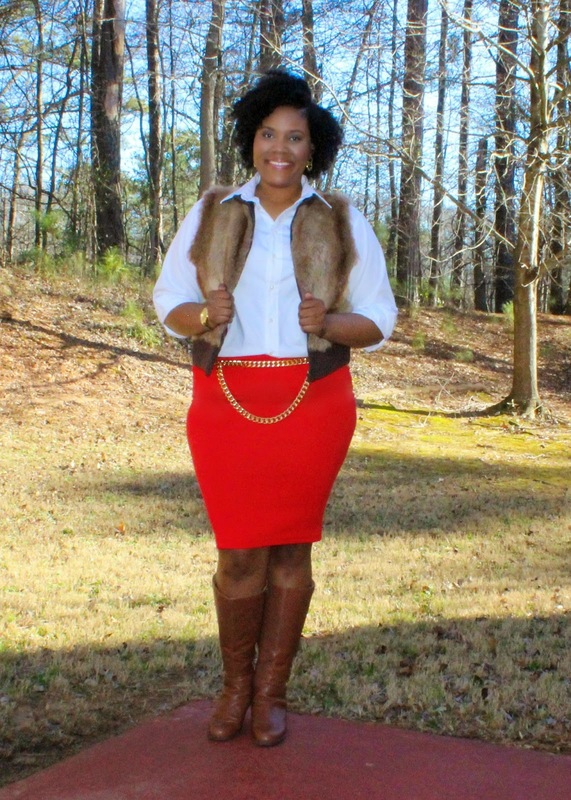 Love that you choose brown instead of black boots!